Buying wholesale wedding dresses from Costco? Most brides don’t have Kate Middleton’s royal wedding budget, but every bride deserves to look like a princess on her wedding day. I recently read that Costco is now offering Kirstie Kelly signature wedding dresses at a major savings of up to 40% off. Now I remember when Wal-mart first started selling funeral caskets online and it caused a big stir in the funeral parlor business. Selling wedding dresses at wholesale retailers like Costco, Sam’s Club, and other could shake up the wedding industry. What about some premium shoes like prada, jimmy choo, & gucci? Will Costco or Sams ever end up offering shoes like this…. even online? I doubt it. Since these shoes, like Rolex watches, get the premium price because of their lack of availability and price point from the majority of consumers, items like prada shoes will remain to be sold exclusively in high shops and large metropolitan cities. Back to the topic at hand, Costco recently partnered with bridal designer Kirstie Kelly to develop a capsule collection of six gown styles to be sold at pop-up salons during wedding-themed sales events the discount warehouse club is hosting across the country. The dresses range in price from $699 to $1,399, and are offered in sizes 2 to 24. “When I was designing this line, and when I thought about what this line represented, I wanted to create a small, tight collection that represented every type of bride and type of wedding,” Kelly says. Jennifer Darmon fulfilled a lifelong dream Saturday afternoon when she walked down the aisle and said “I do” in a Windsor courthouse. Paralyzed after a 2008 car accident, she underwent intense therapy at the Detroit Medical Center. Darmon was afraid of falling until she locked eyes with the love of her life. Then, everything was perfect. “It’s so nice for everybody to be able to see the end result, all the work I’ve put into it over the last couple of years,” Darmon said. Darmon stood through the ceremonywith the help of a walker, which lasted about 10 minutes. Mike Belawetz, Darmon’s new husband, says he’s proud of his wife’s accomplishments. Paralyzed from the hips down after a car accident, Darmon wore leg braces under her strapless white gown and took the first step down the aisle, carefully holding the arm of her father, Alan, and her brother, Kevin. “I’ll take this slow, sweet walk with you,” her uncle Tony Darmon sang, trying not to cry through a song written by Edwin McCain. Jennifer Darmon moved slowly down the 40-foot aisle before 190 friends and family and a throng of news media inside Mackenzie Hall, a historic courthouse in Windsor. Richmond had helped Darmon stretch out her muscles before the wedding. “She was a trouper, just like always,” Richmond said. Darmon moved past her physical therapist, Phuong Vu. The Rev. Robert J. Verkoyen, a pastor at Rock of Help Christian Centre in Essex, Ontario, told the bride and groom that they had been “shining examples” of love and commitment. 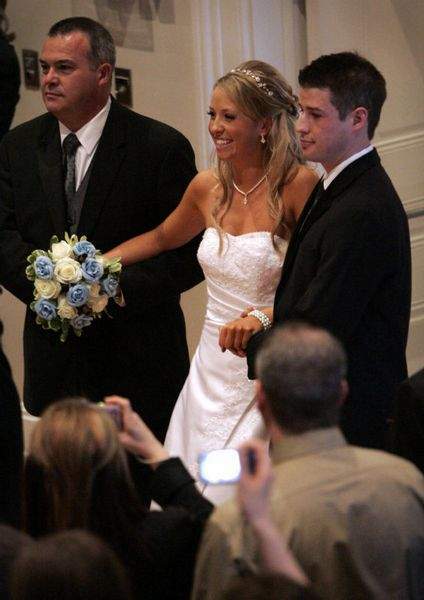 After the accident, Jennifer Darmon told her father that she was upset that she would never walk down the aisle. “Today proved that you can achieve anything you set your mind on,” Alan Darmon said. After the ceremony, Belawetz lifted his bride and carried her down the aisle. She smiled and kissed him gently.